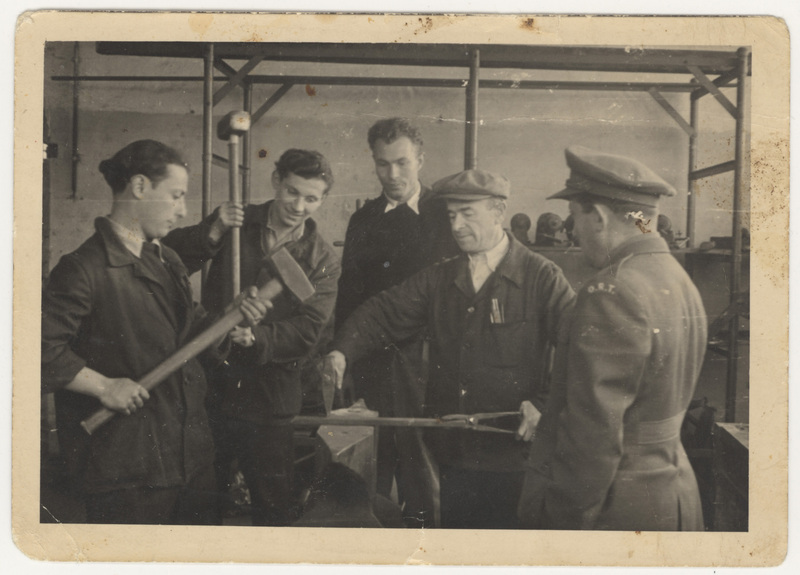 In this photograph, four men are attending a mechanical engineering class given by Kopel Orner. 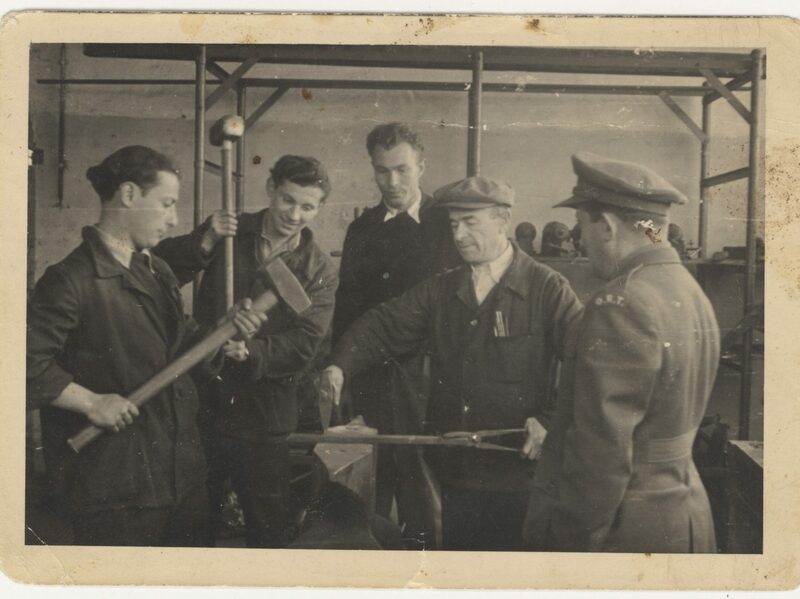 Two of the men hold a hammer as they watch the teacher using tools in the centre. This photograph was taken at the Bergen-Belsen displaced persons camp in 1947. 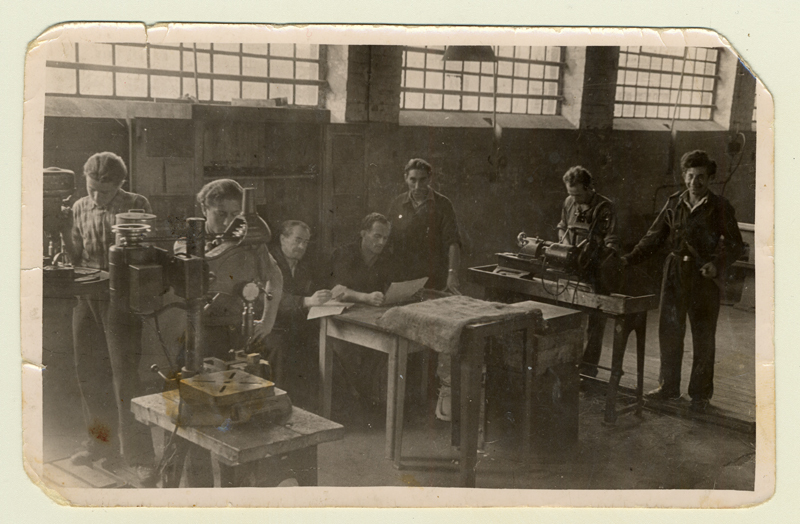 Photograph of men attending a mechanical engineering class at the Bergen-Belsen displaced persons camp in 1947. 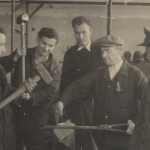 A mechanical engineering class in Bergen-Belsen DP-Camp under the supervision of Kopel Orner in 1947. 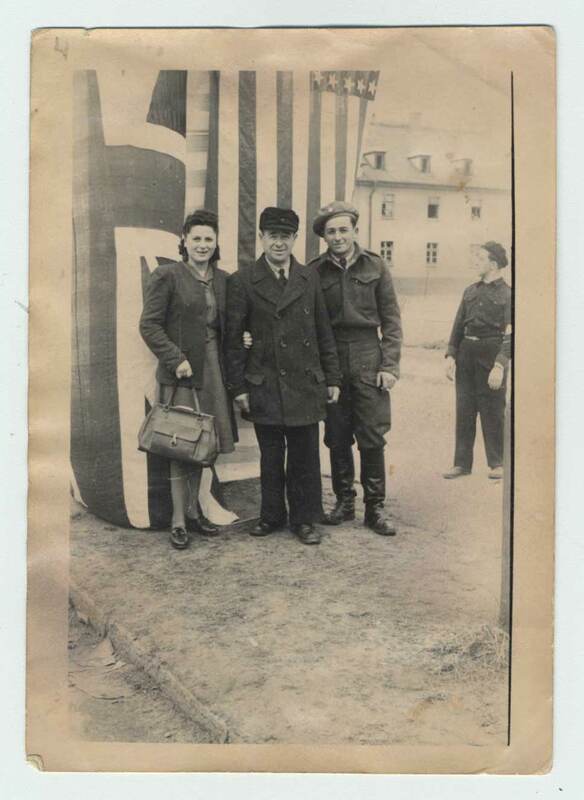 Sara Ostrzega, her father Kopel and brother Israel, at the commemoration of the liberation at the Bergen-Belsen DP camp in 1947. Bergen-Belsen was a concentration camp created by the Nazi regime. 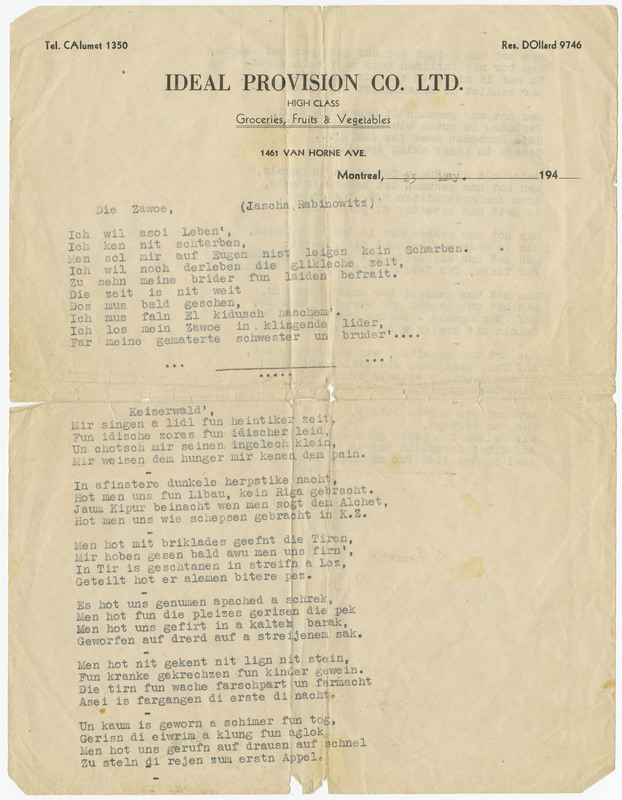 Located in Germany, the camp operated between 1940 and 1945 and more than 50,000 prisoners, the majority of which were Jewish, were murdered there. The camp was liberated by the British Army on April 15, 1945. 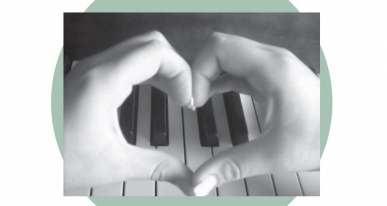 Many refugees spent years awaiting their relocation after the war. Bergen-Belsen was one of the concentration camps converted into a displaced persons camp to accommodate them. 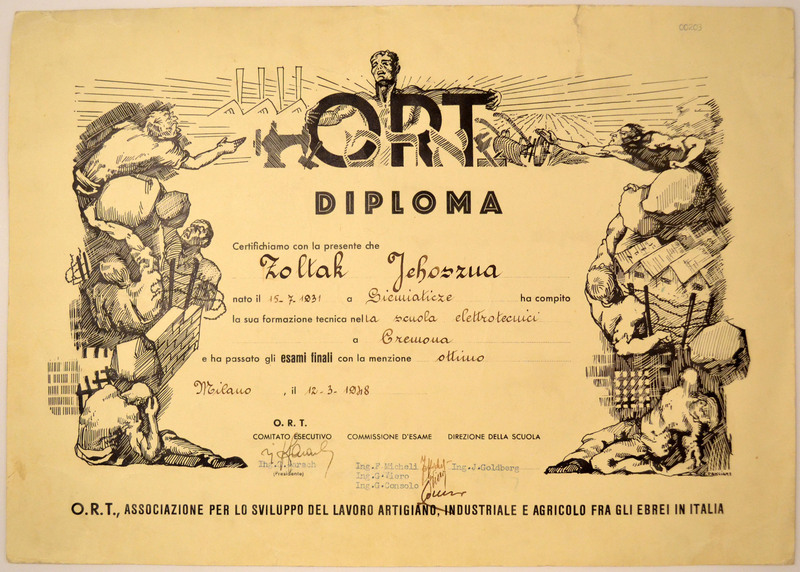 Professional training classes were given by ORT, the “Organization for Rehabilitation through Training”, to prepare survivors for their return to a normal life. Sara Ostrzega, Kopel Orner’s daughter, donated this photograph to the Montreal Holocaust Museum in 1990. 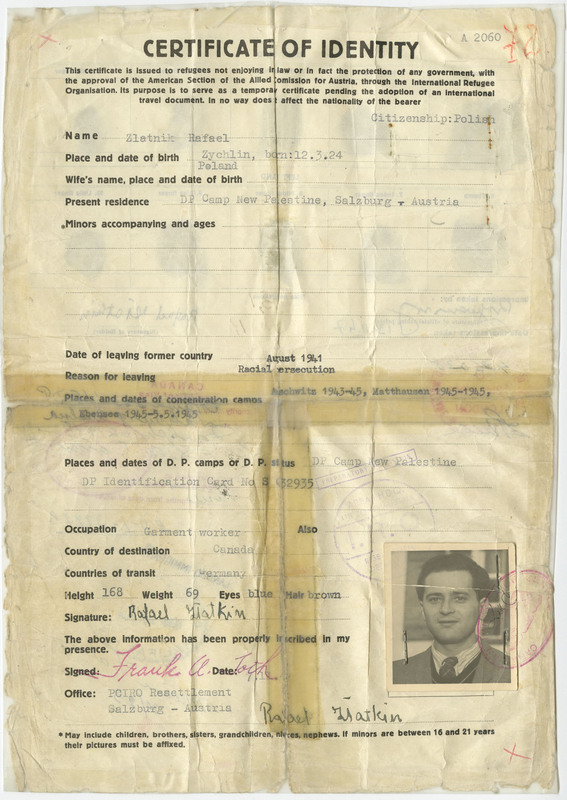 Visit the exhibit “And in 1948, I came to Canada” – The Holocaust in Six Dates.